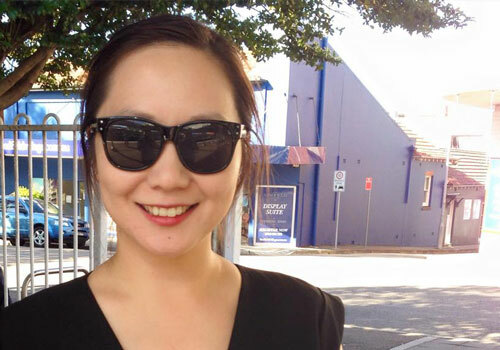 Located in a strange little strip of shops on Burwood Highway next to Deakin University, Taste Dumpling does not catch the eye. It’s hidden to one side of the shopping strip, and though the exterior of the shop is well sign-posted, it still manages to remain somewhat inconspicuous. It isn’t until you look closely and see the crowds of people inside that you begin to realise you might be onto something special. My cousin was actually the first in our family to discover Taste Dumpling. He’s currently doing his PhD at Deakin in Exercise Physiology as well as tutoring undergraduate classes on campus and according to him, Taste Dumpling is the place to go if you’re a uni student at Deakin looking for great food at a great price. On our drive to Taste Dumpling, my dad spends the whole time raving about the pork knuckle, listed on the menu here as “Braised Pettitoes on Rice”. This comes served in two dishes – the first is the giant pork knuckle itself, and on the second plate is a giant serve of jasmine rice and some pickled Chinese vegetables. Trust me, when I say that it’s a “giant serve” of rice, I mean that it’s easily enough for three people! The pork knuckle itself is amazingly tender, and falls apart at the slightest touch. My dad eagerly eats up the loose and fatty skin of the knuckle, whereas I help myself to the tender leaner meat that’s been infused with the delicious blend of soy, herbs, and other spices in the sauce. It’s not a dish you could easily finish on your own, but I highly recommend ordering it if you’re dining with a few people! I ask to order the fried sliced rice cake – it’s one of those dishes that I always mentally acquaint with life in Shanghai. It’s one of my grandmother’s favourite dishes to cook, and I still miss my mother’s rice cake dish that she used to make before she passed away. 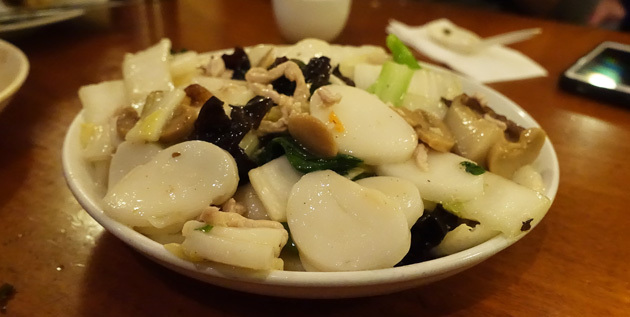 Taste Dumpling’s version is heavy on the rice cake, and light on the vegetables and sliced pork. It’s got a nice clean and crisp flavour to it, and there’s no nasty aftertaste to be found here. 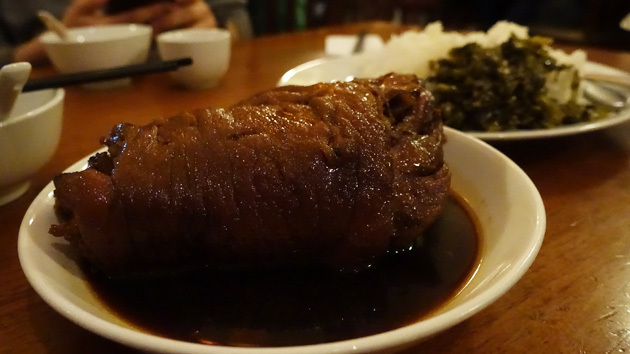 This dish doesn’t suffer from the heavy oiliness that you can find in other Shanghainese restaurants. The fried pork dumplings are another matter though – they’ve been pan-fried with what’s clearly a liberal amount of oil. The bottoms of the dumplings are nice and crisp (though oily) as a result, though the tops still remain fresh. I find the dumpling skins a bit too thick, but the meat inside is well-spiced and very more-ish. 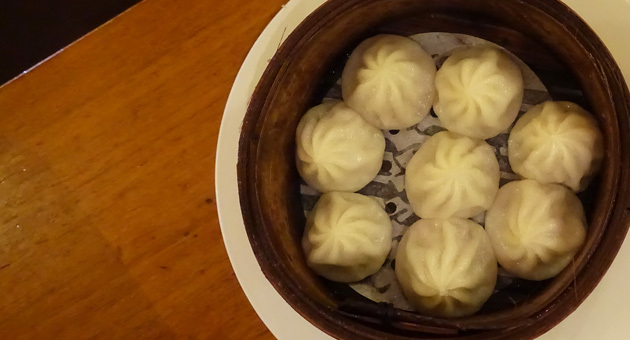 You can’t go to a Shanghainese restaurant without eating xiao long bao! Every time I eat these, I’m reminded of the few months I spent living in Shanghai during my university years, and my favourite street food stall that sold a dozen xiao long bao for $1.50AUD. While these dumplings aren’t quite as good value, they’re still remarkably tasty with a piping hot thick and hearty broth inside that fills your mouth as soon as you bite in. Again, I find the dumpling skin a bit too thick especially when compared to the likes of Din Tai Fung, but it’s still delicious and very enjoyable. Taste Dumpling offers hearty home-style Chinese cooking at a price suitable for the university students in the area. I think if my dad has any say in the matter, I’ll be going back to Taste Dumpling the next time I’m in Melbourne…and I won’t be complaining if he does take me there! the fried dumplings look delish!